In early May 2011, Governor Mitch Daniels appointed four new members to the Board of Indiana School for the Deaf, replacing those whose terms had expired. (ISD's Board has seven voting members. and three nonvoters.) One of the new appointees, Ann Reifel, is an ISD alumna, an ASL teacher with close ties to ISD, and a respected member of the Deaf community. As for the other three, all have connections with Hear Indiana, the state chapter of the Alexander Graham Bell Association for the Deaf—an o rganization that advocates against ASL and signing schools for the deaf, and discourages parents of deaf children from learning ASL. Two of the new Board members have deaf children attending mainstream or oral schools. The nationwide Deaf community was outraged at the appointments. Representatives of the ISD community demanded to know why these three were appointed. They didn't get answers, just political rhetoric, blather, and stonewalling. ISD has never had a Board with a Deaf majority, and there is no legal requirement to do so, since no such law is—as yet—on the books. The Governor can, if he chooses, fill every Board slot with oralists. Reifel is the sole Deaf Board member. Every other nomination submitted by the ISD administration to the Governor's office has been bypassed. This situation is unacceptable to the Deaf community. When they asked Gov. Daniels to revoke the appointments of the three oralists, they were, essentially, told to shut up and take it. A grassroots movement, Pro-ASL Deaf on Board Now! was organized, involving ISD's stakeholders: faculty, staff, alumni, students, deaf and hearing parents of students, and supporters. Parents of ISD students are a notably diverse community, but are committed to their children's success and to their school. A rally was held at the State Capital in Indianapolis on June 7, and got lots of media attention, although some written reportage showed a lack of understanding of the issue—equal and just representation of stakeholders on the Board. Marvin Miller, President of the Indiana Association of the Deaf, and Kim Bianco Majeri, President of ISD's Parent-Teacher-Counselor Organization, have been leading the Pro-ASL Deaf on Board movement. Both are fDeaf and rom strong-Deaf families. (The third leader, Tami Hossler, is the hearing mother of an ISD student, and respected in the Deaf community for her strong advocacy of ASL.) Both Majeri and Miller have children attending ISD. Majeri earned her Bachelor's in Social Work from RIT and her Master's in Deafness Rehabilitation from NYU, and is finishing up her MBA. After their first daughter as identified as deaf, she and her husband relocated to Indiana so their children could attend ISD. She says, "I have been so inspired by our parents, teachers, alumni, and community involvement." 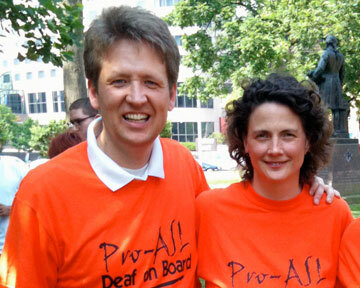 Miller was a co-founder of the original DeafNation, and is a well-known Deaf advocate. Majeri and Miller instend to keep ISD in the spotlight, and the pressure on Gov. Daniels, until their goal of equal representation is reached.